Excel is a familiar—some would say ubiquitous—data analysis tool, which we’re all familiar with to some degree. But if you are an Excel power user, you might find yourself struggling to use it to analyze and visualize complex or high-volume data. In short, you might be using a 1987 application to get answers to 2014 business questions. It might be time for a change. 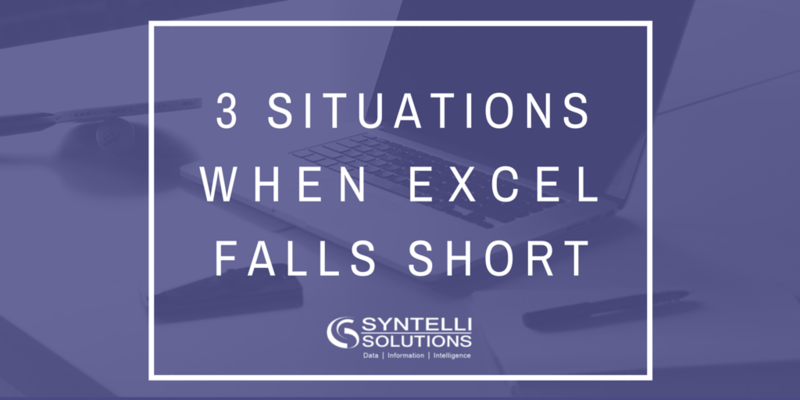 Realistically, Excel has met and continues to meet the needs of many data analysts. It rocketed to popularity because it was easy for novice business users to learn and use. It offered basic visualization tools and macros to automate repeated functions. And, most importantly, it made quick work of converting data into reports that business leaders could understand and use. But, a lot has changed since 1987. Like it or not, we work in the era of Big Data. We must make sense of and get maximum value from the ocean of information our organizations store and maintain. Data discovery—one of the many terms we use to describe Big Data analysis—involves finding useful patterns in the many types of information lurking in servers and data centers. Now, the business questions executives ask and the tools we need to answer them have gotten more complex. And increasingly, business leaders expect to have easy access to data analysis and visualization tools that help them ask and answer these questions on their own. Meeting these expectations takes us far beyond the capabilities of Excel. Do you have doubts? Here are three sample scenarios. How many have you experienced? Limited display capabilities. Being able to see and compare different groups of data in one place can provide insight that isn’t immediately obvious. But when you use many different datasets in Excel, it’s a hassle to place them all in the same place. That’s because Excel spreadsheets still display data in the old two-axis, two-dimension data format. Time-consuming formula or query builds. In Excel, when you query data, you have to configure pivots, formulas, ranges, OLAP cubes, indexes and keys. That takes time. Sometimes, a lot of time, which can become a big commitment. Difficulty gaining insight from tables. If you’re using Excel for Big Data visualization chores, you might struggle to see relationships in your data. That’s because in Excel, you have to pick out the correlations and mathematical representations on your own. Modern visualization software can present a particular correlation with far less time and effort. When you want to see real-time updates of multiple data sets changing and interacting with each other, you need a tool that simplifies data management and makes information easier to understand and use. The TIBCO Spotfire visual discovery and display engine helps simplify the analysis of highly complex data sets. Spotfire data analysis software is designed to provide data analysts with a complete toolkit for analyzing and visualizing high-volume, real-time data. It enables you to visualize your data in ways that display more dimensions of data than your standard Excel charts. And, Spotfire uses built-in intelligence to configure visual query devices such as filters and sliders on the fly. This enables you to quickly sift through massive spreadsheets or databases without writing formulas or queries. The power lies in your ability to ask and answer questions quickly and interactively. contact one of our expert data scientists!